Hello, everyone! Some of you might recall me posting before about the little niblets I nanny—well, the older one has a birthday coming up and I am trying to pick out a present for him! 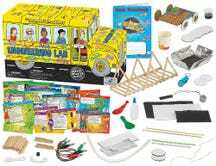 He will be turning six and he LOVES science experiments, so I am thinking of getting a science experiment kit for him, probably Miss Frizzle's Magic School Bus Engineering Lab. It's pricey, but it seems to have a lot of experiments in it so it would keep us occupied for a while, and having activities for us to do together actually makes my job easier! I am not so psyched about the chemistry sets I've seen because they seem geared towards older kids, and while he loves to do gooey stuff like oobleck, I'm not sure he's really ready to learn much about chemistry. He does understand the relationships between molecules, density, states of matter, and temperature in a basic way, which is awesome! (That is, the molecules are moving around in a liquid but they're still in a solid, etc.) But I think basic physics might be the ticket for this year's birthday. 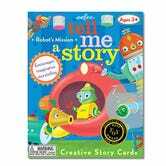 Another thing I really want to get is Tell Me a Story cards by eeBoo, specifically the robot ones. Aren't they cute? Recently we made some picture books together, where he drew pictures and came up with words, and I wrote the words down for him and helped him punch holes and bind the pages together. He enjoyed that activity a lot and was so proud of the books he wrote! So I think he'd enjoy these storytelling cards and they're inexpensive, although the two gifts together are really too expensive I think, sadly. I'm sure his parents don't expect me to get him anything, but he's my little buddy and I want to get him something fun we can play with together! So what do you think? Are there cheaper storytelling cards out there? I can't draw well enough to make my own without them being pretty crappy. And I know there are cheaper science experiment kits, but I looked at a bunch of them and this one is really my favorite. It looks perfect for his age without being too difficult or too simplistic. Plus, the cheaper ones have fewer experiments and I am hoping to get a lot of mileage out of this kit. I keep combing Pinterest for science projects and finding a lot of the same ones we've already done over and over again, and I like the idea of getting a kit that comes with materials rather than a book that just comes with instructions. Any parents or guardians of children out there with advice to give? Also btw the smaller niblet is 18 months and so we have to keep choking hazard toys away from him, but we already do science experiments up on a counter or high table, and the older niblet has Legos that he is allowed to play with as long as he keeps them out of reach of the little one. So I think it's probably fine that these toys aren't really baby-proof, because we would do the experiments during the baby's nap anyway. <3 <3 love you all!